CCTV aka Video Surveillance is seeing an adoption rate like never before and in many situations, its a mandate from many governing bodies to have them installed for safety and investigation purposes. Seagate is a legendary name when it comes to storage devices and their Sv35 has been very popular when it comes to storage of videos in massive lengths. In stepping up the game, finding answers to outstanding issues faced by consumers and also rebranding the lineage, Seagate has launched the SkyHawk series of storage devices dedicated for videos. Though, this is the Sv35 adorning new clothing there are lots of improvements made to the interiors as well. Let’s take a look at the offering. 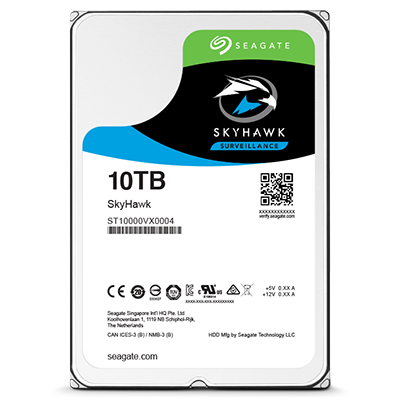 The SkyHawk comes under Seagate’s Guardian series and has a storage capacity of 10TB which more or less caters to most of the businesses that fall under the small to medium sizes. This storage that is 2TB more in capacity than its predecessor is stipulated to store up to 10,000 hours of video in HD quality. The revamped disks have a spindle speed of upto 7,200 RPM which is quite good for its size. The SkyHawk also comes with ImagePerfect firmware that aims at delivering the best performance while keeping the heat generation at check as most of these devices will be running 24/7, thus having a high chance of heating up. The boot up speeds too are said to have had a boost for seamless recording that also has multi-tier caching. The disks also make use of rotational vibration sensors that help reduce disruptions which potentially cause errors during read and write. Speaking of issues during read and write, the SkyHawk also comes with a neat data recovery services option at dire situations. SkyHawk is also sturdy as it supports upto 180TB worth of data writes per yer. Coming with a 3 year warranty offer, the SkyHawk seems to be a good option for small and medium business looking for a very reliable, long term storage that is dedicated for video surveillance purposes. The hard drive is priced somewhere around 40K INR and can be bought by contacting Seagate directly.